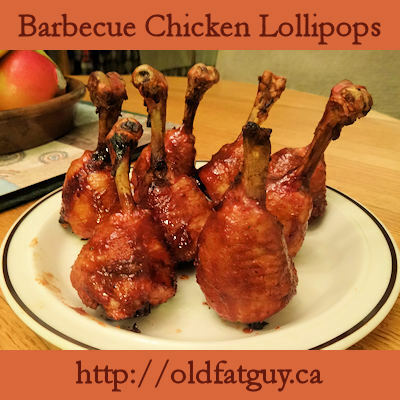 I posted another chicken lollipop recipe a couple of days ago, Mexican Drumstick Lollipops. I had bought a large tray of drumsticks and only used 1/2 of the tray. I decided to try the other 1/2 with some changes for comparison. The Mexican version was dry or without sauce so I went wet or with sauce for this cook. I cut the knuckle off the drumstick on the first version and I left them on for this. Lastly, I went with a lower starting temperature and a high heat finish on the Mexican and will go with a constant moderate temperature on this version. I cut around the drumstick bone just where the meat started to widen. I pulled the meat and skin below the cut over the knuckle. I trimmed any ligaments and tendons showing with shears. I cut a flat spot on the top of each drumstick so they would stand up. Keep the trimmings for making chicken stock. I dusted the drumsticks with my Basic Barbecue Rub. 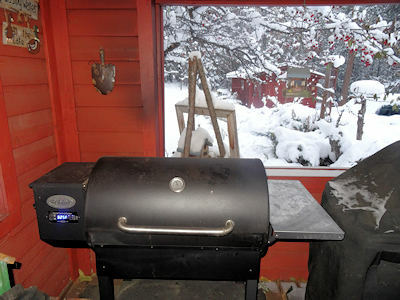 I preheated my smoker to 325 F. They may be cooked in a 325 F oven as well. You can note in this picture that winter has arrived in the Canadian Rockies! I placed the drumsticks upright on a perforated barbecue sheet and smoked for 1 hour to an internal temperature of at least 165 F.
I brushed them with a generous layer of Sweet Baby Ray’s barbecue sauce and put them back on the barbecue sheet for about 30 minutes to set the sauce. Both versions of the lollipop were great but I think I prefer this wet version. The sweet/spicy combination really tastes great with the rich dark drumstick meat. Just like the prior smoke, the drumsticks are easier to eat as the tendons have been removed. The skin was great! However, I can’t decide whether I like the knuckle on or off. Sigh. I will have to make more to help me decide! Cut around the bone on the drumsticks just at the point where the meat starts to thicken. Pull the skin from below the cut over the knuckle at the end of the bone and remove it. Cut any tendons or ligaments with shears. Cut a flat spot on the top of each drumstick so they will stand up. Rub a generous amount of barbecue rub onto the drumsticks. Preheat your smoker or oven to 325 F.
Stand the drumsticks on end on a tray and cook for 1 hour to an internal temperature of over 165 F.
Brush the drumsticks with a generous amount of sauce and stand on the tray to cook for another 30 minutes to set the sauce. Brrrr! You can keep that snow up there. The drumsticks however, you are welcome to share! You need to come to the mountains and toughen up! Snow is pretty!